Become a BMF Grant Writer! 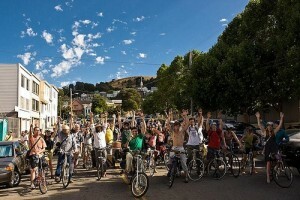 The San Francisco Bicycle Music Festival is the largest 100% bicycle-powered music festival in the world! Featuring the original fully bike-portable Pedal-Powered sound stage, mobile LiveOnBike performances, and over a dozen Bay Area musical acts, the Bicycle Music Festival is a free annual event founded in 2007. Taking place on the Saturday closest to the Summer Solstice, the Festival runs all-day (and late into the night) and has been called “the greenest music festival ever conceived.” It has showcased the music of prominent and talented local artists such as Sean Hayes, Manicato, Oona Garthwaite, Tornado Rider, Jazz Mafia, and more. In 2010, we evolved from our humble roots as a guerrilla-style operation to a fiscally-sponsored non-profit project under the auspices of the San Francisco Parks Trust’s Park Partner program. Armed with a 501(c)(3) tax ID, we successfully raised about $3,500 for permits and supplies, including a $1,500 Community Arts Grant from the Zellerbach Foundation. For 2011, Bicycle Music Festival (the entity that produces the SF Bicycle Music Festival) is in need of a grant writer who appreciates the mission, the culture, and has the skills and passion necessary to help us fund a 2011 budget of $10,000-$15,000. Ideally, the Grant Writer will be paid out of the grant itself, although another pay arrangement based on our collective ability to raise money may be possible. Interested persons should send a short email explaining some combination of your background as a grant-writer, your passion for bicycles/sustainability/community empowerment, and why you are interested. Email: jeff@bicyclemusicfestival.com with letters of interest and/or questions. Bookmark this article Become a BMF Grant Writer!